Dr Li Zhisui, Mao Zedong’s Private Physician was a privileged man. On October 1, 1949, he was allowed to stand on the rostrum of Tiananmen Square to attend the ceremonies of the foundation of the People’s Republic of China. It was a ‘crisp, clear, and chilly day that makes autumn in Beijing the most magnificent season’ recalled the doctor. This was 60 years ago, a full circle in the Chinese calendar. When at the end of the 1960’s, Mao decided to economically overtake the United Kingdom, everybody thought that it was another mad dream. Sixty years after the parade of October 1, 1949, this dream has become true. This year, China’s GDP will surpass that of Japan, taking the second slot after the US. Thirty years ago Deng Xiaoping began to promote an open door policy with the same dream. Jeffrey Sachs, director of the Earth Institute at Columbia University recently told Xinhua, the Chinese news agency: "We all believe, at least I believe, that China will ... relatively soon, within the next three decades perhaps ... become the world's largest economy… So, I think China has a unique position in the world. It's not only the most populous country but it will become the largest economy in the world, and that's rather natural because it's such a large size." Nobody can doubt today that China is a super economic power. A domain in which China has done exceedingly well is infrastructure. The Communist regime in Beijing started to invest heavily in roads and airports in remote parts of its new Chinese empire (for example in the Aksai Chin with a road cutting across the Indian territory) in the 1950’s, but this development was limited in scope. The purpose was ‘to defend the borders’. It is only relatively recently that China has made tremendous progress in the field of infrastructure; but whoever today visits Shanghai, returns flabbergasted; in this domain, India is 30 or 40 years behind its Asian rival. Deng Xiaoping’s visit to Southern China in 1992 was instrumental in revitalizing the coastal areas and developing the infrastructure seen today. Many believe that Deng's southern tour changed the face of China for ever. His slogan ‘To Get Rich Is Glorious’ helped to create a wave of entrepreneurship which has driven China's economy since. The new open economic policy announced by Deng in 1978 brought its first results in the early 1980’s with the establishment of Special Economic Zones. It was the beginning of the Chinese economic miracle. This signaled a new massive investment in infrastructure. On October 21, 2008, China’s State Council announced a new economic stimulus package. Two weeks later, Beijing confirmed that it would put in place a two-year $586 billion package, mainly dedicated to infrastructure projects. This financial package would finance schemes in 10 major areas, including affordable housing, rural infrastructure, water, electricity, transport, the environment, technological innovation and rebuilding areas hit by disasters. India can only look with awe at China’s infrastructure development. 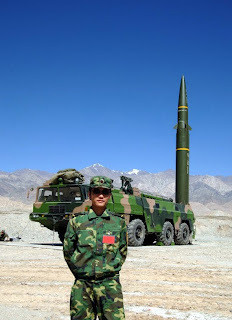 One detail demonstrates the new self-confidence of the Beijing mandarins: a White Paper (WP) entitled China's National Defense in 2008 was released in January 2009; and not on any odd date. The Chinese, always found of symbols, chose the day of the swearing-in ceremony of President Barak Obama. Pundits will also point out that it was Martin Luther King Day, a Day dedicated to non-violence: the choice of the State Council was certainly not fortuitous. Though it was not a ‘breaking news’ type of publication, many interesting trends emerge while going through the 14 chapters of the WP. Amongst these, ‘informationization’ and modernization are the most important aspects. The WP is an exercise in public relations for the People’s Republic of China which wants to project a new image: that of a responsible nation, fully involved in global issues facing the planet and ready to help find solutions to these problems. 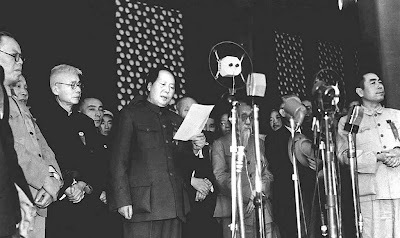 The Cultural Revolution days, when Mao Zedong did not care about what the rest of the world thought of China, are gone. This is certainly a progress, though some of the old thinking is still present in today’s China. For example, strategist Jin Yinan, who teaches at the National Defense University in Beijing recently wrote: “China can not emerge in the midst of nightingale songs and swallow dances.” It sounded like Mao for whom ‘revolution was not a tea party’. For Jian, if China is to reach its objectives, it had to “hack out a path through thorns and thistles”. He added: “When a country and a people have reached a critical moment, the armed forces often play the role of pivot and mainstay”. The fact that Jin was invited in July to give a lecture to the Politburo on military strategies, tends to show that Modern China is not rising with nightingale songs (peaceful rise) alone. In April, Huang Kunlun, another analyst, commented on ‘the boundaries of national interests’ in the Liberation Army Daily. He argued that China’s national interests had now gone beyond its land, sea and air territories. It included areas such as the oceans used by Chinese oil tankers and even outer space: “Wherever our national interests have extended, so will the mission of our armed forces …given our new historical mission, the forces have to not only safeguard the country’s ‘territorial boundaries’ but also its ‘boundaries of national interests’. For the purpose, the PLA plans to build four aircraft carriers in the coming decade and several nuclear submarines. One understands the statements of the former Indian Navy Chief and the present Air Chief, India is far behind as far as the equipment of its armed forces is concerned. It is not the ‘swallow dances’ of the Indian diplomacy which will counter a quasi-superpower neighbour. For many years, Chinese diplomacy was limited in its scope to nearby regions such as the ASEAN bloc, the Shanghai Cooperation Organization or international bodies such as the United Nations, the World Bank and the International Monetary Fund. Later, for economic reasons this extended to Africa and Latin America. The FT added that “Mr Zhou’s proposal did not emerge from thin air” More than 70% of the 2 trillion dollars foreign reserves are held in green curency. Today, China dares taking on the US in international fora. China’s projection of itself as a soft superpower is visible in many other fields too. Beijing has earmarked $ 6.62 billion for ‘overseas propaganda’. Xinhua News Agency and CCTV will enhance its programs in different languages for the West, Asia, Middle East and even Africa. An English news channel modeled on Al Jazeera will beam the latest news (or propaganda) from China. Beijing will also set up some 350 Confucius Institutes patterned on the German Goethe Institute, around the planet. It should help to spread Chinese culture and enhance ‘the overall attractiveness of the China model’. This at a time when France has not enough funds to finance its Alliance Française. Can India dream of 350 Tagore Institutes in Asia and elsewhere around the world? Several more examples could be cited to show that the dream of the PRC’s founders, the emerging of new, strong, self-reliant and modern China has become true. The question remains: does this make of China a Superpower? China being fully awake today, should the world tremble? Thus spoke General Chi Haotian, former Chinese Defense Minister and Vice-chairman of China’s all-powerful Central Military Commission. Can you imagine any other Defense Minister in the world speaking such a language? This nationalism has been exacerbated by the economic rise of China and the success of the Beijing Olympics Games. The leadership conveniently uses this sentiment for its own purposes. But if China is to play a leading role in world affairs, ultra-nationalism is definitely an impediment. A more altruistic and ‘internationalist’ attitude will have to emerge in the corridors of Beijing for it to earn a respected place on the international scene. The mantra of China über alles does not rhyme with modern civilized society. A Totalitarian RegimeFor the past sixty years, the People’s Republic of China has failed to introduce a modern system of governance. Though the word ‘people’s’ is recurrent in all State institutions in China, since 1949 the nation is run by a single Party. Ordinary people have no say in State affairs. Laws or rights which are acknowledged as universal by world bodies remain unimplemented by the leaders in Zhongnanhai. Beijing pretends that they are irrelevant to modern China as being a Western invention. But democracy is not a concept confined to the West. Is Mr Hu aware that democracy (from the Greek demokratia, ‘power to the people’) existed in Asia and particularly in India, long before it was introduced in Greece. National People’s Congress Chairman Wu Bangguo has however recently declared that China will ‘never go down the devious path’ of ‘Western institutions’. Whether Beijing agrees to it or not, human rights, basic personal laws or universal suffrage are today values accepted by all non-rogue nations. The Chinese economy faces a similar problem: it remains controlled by the lone Communist Party: there are 150 Party–run monopolies in sectors as diverse as petroleum, steel, banking or telecommunications in China today. Beijing may open 350 Confucius Institute the world over, but which type of culture or civilisational values does Beijing pretend to ‘export’? But when intellectuals speak up, they are immediately arrested. In 1979, Wei Jingsheng wrote about China’s Fifth Modernization on the Democracy Wall in Beijing. Thirty years later progress seems to have gone in reverse gear in the Middle Kingdom. While Wei advocated individual liberties; (‘freedom’ was the only ‘modernization’ which mattered, improvement of living standards could come later), the fact is that in 2008, hundreds of known writers, intellectuals and professors who signed a manifesto called Charter ’08 (asking the CCP leadership to allow the People of China to enjoy civil rights enshrined in United Nations covenants), have been harassed, some even arrested. Liu Xiaobo, the leader of the Charter ’08 movement has himself been incarcerated by CCP authorities. As long as this issue is not tackled, China can not rise to the top. In such cases, it appears that it is the Communist leadership which is trembling. Another issue which makes Beijing tremble is the ‘unrest in nationalities areas’. Unless this problem is solved to the satisfaction of all concerned, China will be not able to take the place of a respected Power on the world scene. One remembers that in March/April 2008, the Tibetan Autonomous Region as well as the Tibetan inhabitants regions of Qinghai, Gansu, Sichuan and Yunnan witnessed the worse unrest and riots in 50 years. In July 2009, it was the turn of Urumqi, the capital of Xinjiang to be in the news. Violence erupted, resulting in at least 200 people dead and some 1,000 wounded. A parallel with Tibet was immediately made. As on the Roof of the World, tensions have not been a new phenomenon in a Muslim province which has been flooded (like Tibet) by millions of Han settlers over the past decades. The Uyghurs have sporadically demonstrated their resentment against Han colonization. The Communist Party’s local satraps were quick to blame the incident on a ‘foreign’ hand. 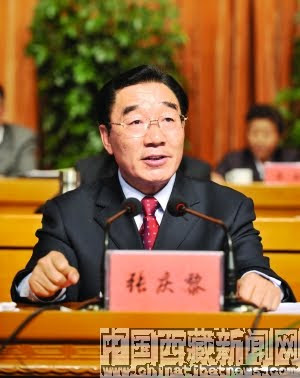 Xinjiang CCP boss and Politburo member, Wang Lequan declared that the riot in Urumqi showed the violent and terrorist nature of the separatist World Uyghur Congress leader Rebiya Kadeer. In March 2008 in Tibet, the Dalai Lama was similarly called a ‘wolf in monk’s dress’ by Zang Qingli, the Tibet Party Chief. The regime in Beijing seems incapable of striking the right note. A report prepared by a group of Chinese lawyers, the Beijing Gongmeng Consulting on the 2008 riots in Tibet is an eye-opener. It entirely contradicts the Party’s official version, but who is ready to listen? The final conclusions are not far from the Tibetan Diaspora’s views: “Earnestly listen to the voices of ordinary Tibetans and on the basis of respecting and protecting each of the Tibetan people’s rights and interests”. For the past 50 years the Party has been unable to deal with these problems. The negotiations with a good-willed Dalai Lama have never even taken off. Sixty after its foundation, it appears that the PRC is pulled towards an ever greater authoritarian way of functioning. Take the post economic crisis situation: with the huge expenditures to be incurred on infrastructure, the State enterprises only will benefit, thereby reinforcing the Party and in particular the Politburo Standing Committee. The PLA’s role is also constantly reinforced (allowing people like General Chi Haotian to get away with his declarations). Today, the PLA plays a role not only in China’s external defence, but has become indispensable to suppress some 100,000 protests, riots and unrest which occurred annually in the mainland due to environmental issues, corruption or unemployment problems. This does not take into account the restive situation in Tibet or Xinjiang. A superpower is usually able to help sorting out regional, if not international issues. Beijing has tried its hand in the Korean imbroglio. One of the reasons why Beijing has not been successful so far, is that the Communist authorities are reluctant to be tough on North Korea when required. Further, in several cases, the Chinese leadership has sided with rogue States such as Myanmar, Sudan, Angola or Zimbabwe. Despite its long-friendship with Teheran or Islamabad, Beijing has never been able to convince these States to follow the rules accepted by all other nations. China is rich. Several Chinese State corporations are on a ‘going out’ scheme to buy strategic assets the world over. It is not too difficult in Africa or Latin America where bribing a few political leaders helps, but it is less easy when it comes to Western multinationals. These mergers and acquisitions (M&A) have usually been related to oil and other raw materials. Chinese moves are watched by a trembling West. Is a return of the Yellow peril being witnessed? Petrochina, Sinopec and CNOOC, China’s oil monopolies have already been involved in overseas M&A worth $12 billion in the first half of 2009 (80% more than during the same period in 2008). China’s Aluminum Corporation (Chinalco) tried recently to acquire 18% (worth $19.5 billion) of the British-Australian mining corporation Rio Tinto. Shivers were felt around the world. If Beijing had succeeded, China would have had to access to most of the iron-ore and copper mines in Australia. It is a good reason for the world to tremble. Beijing’s diplomatic assertiveness is well known. The Communist leadership uses a term: ‘Red-line Diplomacy’. Beijing ‘draws red lines’ around issues it considers vital to its core interests. Strangely, it often uses the Panchsheel principles for its purpose, particularly ‘non-interference in the internal affairs of other countries’ (even giving the paternity of the formula to former Premier Zhou Enlai). This principle are quoted not only for Tibet, Xinjiang, or when the Dalai Lama is to visit a foreign country, but also when India wants to deploy troops in Arunachal Pradesh or when a world body wants to question Beijing on human rights. The spokesperson of the Ministry of Foreign Affairs then barks so loudly, that the interlocutor starts trembling and generally backs out (this even happened to President Sarkozy of France after he ‘dared’ to meet the Dalai Lama in Poland last year). This Red-line ‘barking’ diplomacy may be a ‘Chinese characteristic’, but it is certainly not the attribute of a mature State, a Super-power to be. During the next 60 years, China has a lot of progress to make in these fields and many others. In an article in the China Brief of the Jamestown Foundation, Willy Lam reports that Xi Jinping, the Chinese Vice-President did not make it to the all-powerful Central Military Commission. 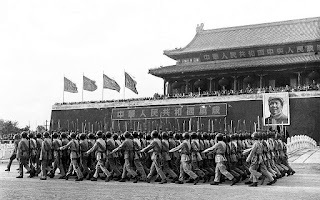 In April 1989, Gorbachev preached glasnost (transparency) on the Tienanmen square, but twenty years later, it seems that 'transparency' has not permeated as yet the opaque leadership of the CCP who is busy with the preparations of the 60th anniversary of the Republic's foundation. 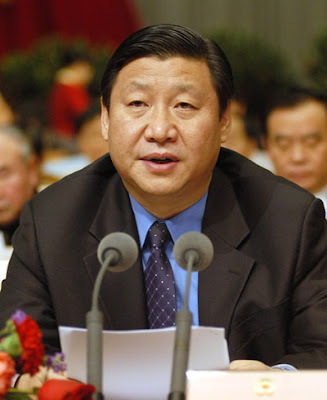 Jinping is the son of Xi Zhongxun, one of the senior-most leaders of the First Generation of the CCP. He was very close to the late Panchen Lama and wrote a report for the Party on the famous 70,000 character petition from the Panchen Lama to Premier Zhou Enlai. In 1962, like many other leaders , Xi Zhongxun fell out of favour; he was accused of disloyalty to Chairman Mao. Was he not tough enough with the Tibetan people? Who knows? Xi was however rehabilitated in the 1980's; he later participated to the setting up of one of the first Special Economic Zones in Southern China. Is his father's past catching up with Young Xi? The biggest piece of news to have come out of the Fourth Plenary Session of the Chinese Communist Party’s (CCP) 17th Central Committee is what that did not happen: the induction of Vice-President Xi Jinping into the policy-setting Central Military Commission (CMC). This is despite widespread reports by several domestic and foreign media that Xi, who is also a Politburo Standing Committee (SPC) member and President of the Central Party School, would be made a CMC vice-chairman in order to buttress his position as heir apparent to President and CMC Chairman Hu Jintao (The Associated Press, September 16; Ming Pao [Hong Kong], September 19; Straits Times [Singapore], September 11). 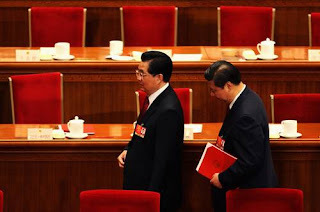 More importantly, however, the Xi episode has thrown into sharp relief a major concern of the Central Committee plenum: the expansion of “intra-party democracy” and reform of the cadre system so as to raise the “governance ability” of party-and-government officials. 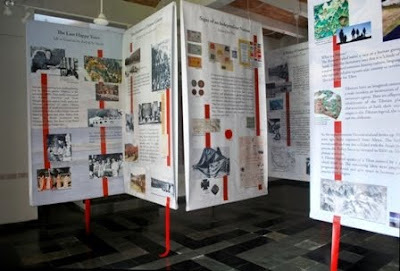 Our exhibition Glimpses on History of Tibet is now available online. These 25 snapshots demonstrate that in the past Tibet was an independent nation and though for sometime it lived in isolation, during most of the last 4000 years Tibet had constant contacts and interactions with the neighbouring nations. In some cases, Tibet was influenced by other cultures; in some others it spread its messages to other nations. 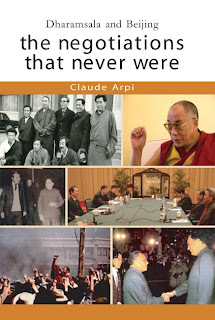 My new book The Negotiations that Never Were — Dharamsala and Beijing published by Lancer Publishers will be released in October. To know more and order, click here. There is a debate around the nuclear scientist K. Santhanam's declarations whether the Pokhran II nuclear tests were a success or not. Though I am a dummy in this field, I think it is a wrong debate. The only question is: did the Indian scientists get enough information to be able to continue their work in labs in simulation? It seems though difficult to get enough data with one or two tests (successful or not). Remember the French in Mururoa (and the Rainbow Warrior episode). The question seems to be: what is the quality of the bomb and its degree of the miniaturization. The National Security Advisor should read the article of Thomas C. Reed, The Chinese Nuclear Tests 1964-1996 in Physics Today, he will learn a lot about tests. With an 'arsenal quality frozen at a relatively primitive level,' it means India has only two alternatives today: Either to conduct new tests (and the 123 Agreement will be terminated) or do simulations for which very powerful computers are needed. 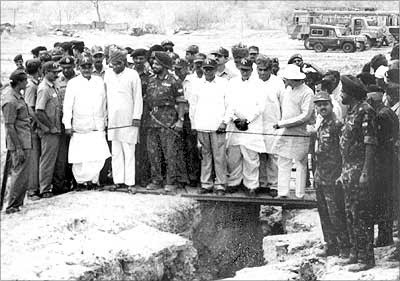 After the Atal Bihari Vajpayee government had declared a moratorium on the tests following Pokhran II, it is doubtful if any government can risk the ostracisation of the past. The solution is therefore computer simulation. And it is probable that New Delhi hopes to get access to sophisticated equipment which will allow Indian scientists to proceed with their military research. Has the Manmohan Singh government already signed a deal behind the deal to get the required equipments? It is very possible. And in any case, once the 123 deal is through with the IAEA and the Nuclear Suppliers Group, computer merchants will be flocking to Delhi to do business." While the controversy over the Dalai Lama’s visit to Tawang still rages in India, another visit has received rather low media coverage. The US President Barack Obama's emissary, Valerie Jarrett flew to Dharamsala, Himachal Pradesh where she called on the Dalai Lama. Jarrett, a Senior Obama’s Advisor and an Assistant for Intergovernmental Relations and Public Liaison was accompanied by Maria Otero, Under Secretary in the State Department and the Special Coordinator-designate for Tibetan issues. The fact that Ms Otero is only a designate-Coordinator more than 9 months after President Obama assumed office as the President of the United States shows the little importance given to Tibet. Obama decides not to offend the Chinese leadership two months before his visit to Beijing; but as it does not befit a great champion of oppressed people to refuse to meet with the Tibetan leader during his forthcoming to the United States, he preempts critics by rushing the two ladies to ‘brief’ the Dalai Lama and explain the situation. 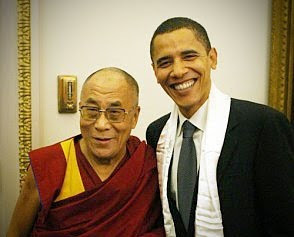 Even though the US President’s Envoys said that Obama could meet the Dalai Lama at a later date, the present move is called kowtowing in Chinese. 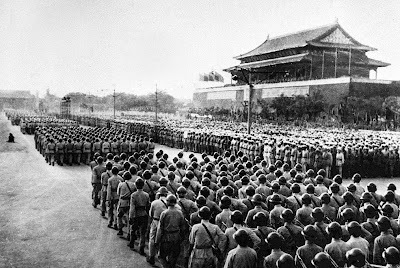 Obama’s advisors will learn one day that it is not smart policy to kowtow to a totalitarian regime like Beijing. Even the habitually back-bending Indian diplomats know this very simple truth. When Chhime Chhoekyapa, the Dalai Lama’s Secretary, announced the Tibetan leader’s plans to visit the State of Arunachal Pradesh during the second week of November, the Indian officials were in two minds, especially after the Foreign Ministry spokesperson Jiang Yu stated: "We firmly oppose the Dalai [Lama] visiting the so-called Arunachal Pradesh". The question was “should India appease China and accept Beijing’s diktat?” Jiang Yu had also stated that the visit "further reveals the Dalai clique's anti-China and separatist essence". South Block remained firm. External Affairs Minister SM Krishna said that the Tibetan leader could go anywhere in India: "Arunachal Pradesh is a part of India and the Dalai Lama is free to go anywhere in India." Contrary to the relatively new team of Barak Obama, the ‘old China hands’ in Delhi are aware that if you once accept a ‘protest’ from Beijing, there will be no limit to new demands or complaints. India has experienced this when the Indian Prime Minister visited Arunachal, with any new infrastructure development in the State or with deployment of armed forces. Though Washington does not have the same stakes and compulsions as Delhi, the US has remained active in the Tibetan issue in the past, trying to promote contacts, if not negotiations, between Dharamsala and Beijing. Under Section 611 of the Foreign Relations Authorization Act, 2003 (Tibetan Policy Act of 2002), a report on the state of the negotiations between Dharamsala and Beijing has to be regularly presented by the White House to the US Congress. The last US Administration, though not appreciated for its policies (and actions) in world affairs regularly raised the Tibet issue with the Chinese leadership. Unfortunately, when Hillary Clinton went to China soon after taking up her job as Secretary of State, she did not utter a word about Human Rights or Tibet; a great change from the Bush Administration. The 2007 US Report explained that since he assumed Office in January 2001, President Bush had consistently urged the Chinese Government “to engage in substantive dialogue with the Dalai Lama or his representatives, and to respect the unique cultural, linguistic, and religious heritage of the Tibetan people”. On November 9, 2005, President Bush received the Dalai Lama at the White House. The President is said to have reiterated the strong US commitment “to support the preservation of Tibet's unique religious, cultural, and linguistic identity and the protection of the human rights of all Tibetans”. Secretary of State Condoleezza Rice and Paula Dobriansky, the then Special Coordinator for Tibetan Issues attended the meeting. 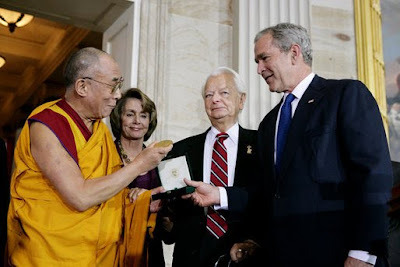 In October 2007, when the Dalai Lama was awarded the Congressional Gold Medal, the highest civilian honour the legislature can bestow, President Bush and his wife attended the event by the side of Nancy Pelosi, the House Speaker. A few months later when she visited Dharamsala, Pelosi affirmed: "The United States must continue to be committed to meeting the challenge that Tibet makes to the conscience of the world." It seems that the Obama’s Administration, which has been elected to ‘change’ the US and the world, is not aware of this very basic notion. Prof. Samdhong Rinpoche, the Tibetan Prime Minister rightly laments: "Even the US government is doing some kind of appeasement… today economic interests are much greater than other interests." Money makes the world go round, where is the Change? According to Chhime Chhoekyapa, the Dalai Lama’s Secretary, the Tibetan leader plans to visit the State of Arunachal Pradesh during the second week of November. A visit by the Dalai Lama to Tawang was already scheduled last year. Invited by the Chief Minister Dorjee Khandu, he was to inaugurate a hospital for which the Tibetan leader had contributed Rs. 20 lakhs. Finally, the Dalai Lama had to cancel his trip to the border State, as he did not receive the necessary clearance from Delhi. Probably South Block did not want ‘to make things worse with China’. Though Choekyappa said that the details have not yet been worked out, Beijing was quick to do what it does supremely well: protest and object. Foreign Ministry spokesperson Jiang Yu immediately declared: "We firmly oppose the Dalai [Lama] visiting the so-called Arunachal Pradesh." He spoke of Beijing’s ‘strong concern’ and said that it "further reveals the Dalai clique's anti-China and separatist essence". The Chinese Embassy in Delhi confirmed the Spokesman’s statement. New Delhi however clarified that the Chinese ‘protests’ were unwarranted, as the Dalai Lama was free to travel anywhere in India. One of the arguments usually used by the Chinese to oppose anything happening in Arunachal (whether it is the visit of the Indian Prime Minister, infrastructure development or deployment of armed forces) is that Arunachal is theirs. They are so convinced of it that they have included the development of the area in their Plan expenditures for the Tibetan Autonomous Region’s southern districts. One of the Chinese ‘proofs’ is that Tsangyang Gyatso, the Sixth Dalai Lama, the great poet and lover was born near Tawang in 1683. This is an extremely lame point. Is France part of Kashmir because Dr. Karan Singh is born in Cannes on the French Riviera? What about Liaquat Ali Khan, born in Karnal, Haryana; Zia-ul-Haq born in Jallundar or Pervez Musharraf in Darya Ganj in Delhi? Does it make Haryana, Punjab or Delhi part of Pakistan? The truth is that during the Tripartite Conference between British India, Tibet and China held in Simla in 1914, the plenipotentiaries of India (Sir Henry McMahon) and Tibet agreed to delineate their common border on a map and they put their seal on it. Today, the Chinese vociferously say that they have never recognized the McMahon Line and that the entire State of Arunachal, south of the Line, belongs to them. The interesting point is that they did not always hold such an intransigent view. During the 1950’s, the Chinese Premier Zhou Enlai was ready to accept the McMahon Line as the border between ‘China’s Tibet’ and India. This is the core of the sage of fifty years of border talks between India and China. Today, it is no “small questions about two miles and two miles there”, it is more than 83,000 sq Km which are shamelessly claimed by China. The visit of the Dalai Lama will be another occasion for the Tibetan leader to reiterate that he has always stood by the McMahon Line and Zhou’s argument that the Tibetans had objected was entirely fallacious. This perhaps why Beijing gets upset, today they can’t use the Tibetans anymore. The Sixth Dalai Lama, Tsangyang Gyaltso (the Precious Ocean of Pure Melody) who loved freedom above all, would have probably written a beautiful poem on Chinese pretensions. To have sent the two ladies seems a clever move from the Obama Administration to avoid a meeting between the US President and the Dalai Lama during the latter's visit to the US in October. Now a meeting between the 2 leaders is postponed till after President Obama's trip to China in November. Already Secretary of State Clinton had 'forgotten' to mention Tibet during her first visit to Beijing, soon after taking over. The United States have probably too many 'common economic interests' with China to play a meaningful role in the Tibetan issue. But the Tibetans remain hopeful that a solution will come from Washington. US President Barack Obama's emissary, Valerie Jarrett (center) along with US State Department Under Secretary Maria Otero (right) talking to His Holiness the Dalai Lama during their meeting at the latter's residence, September 14, 2009, photo: dalailama.comDharamsala, September 14 - US President Barack Obama's emissary, Valerie Jarrett, called on His Holiness the Dalai Lama today at the latter’s residence here. Jarrett discussed with His Holiness on the best way the United States could assist in the resolution for the Tibetan issue, particularly in the light of the first visit by President Obama to China in November, a statement on the Tibetan leader’s official website said. His Holiness also conveyed his strong belief that the United States and China need to have very good and principled relations. Ms. Jarrett, Senior Advisor and Assistant to the President for Intergovernmental Relations and Public Liaison, conveyed President Obama’s greetings to the Tibetan leader who returned here Sunday from a five – day tour of Slovakia and Czech Republic. 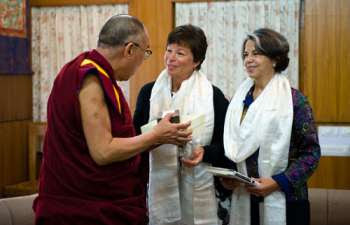 She had been sent to brief His Holiness about the Obama Administration's approach to the Tibetan issue. During the talks that lasted more than two hours, the Tibetan leader expressed his concerns on a number of issues, including global conflicts and matters relating to the environment. He applauded President Obama's initiative to tackle these issues through cooperation, outreach and dialogue and urged him to continue doing so. Jarrett introduced State Department Under Secretary Maria Otero to His Holiness as the designated Special Coordinator for Tibetan issues. His Holiness also updated Jarrett on the dialogue process with the Chinese leadership, including the presentation of a comprehensive Memorandum on Tibetan autonomy to the Chinese leadership. His Holiness greatly appreciated President Obama's concern for the situation in Tibet and expressed hope that the Tibetan people can see progress in the resolution of their problem during Obama’s presidency. We are on the right track. Finally, the babus would have to publicly admit that they do not have a declassification policy — a matter of shame for a country like India with a rich (though troubled) history. Once they admit the lack of policy, they will have to accept that there is no trained staff to do the job. It will be a more difficult issue to solve. NEW DELHI: Taking a cue from the Prime Minister's Office (PMO), both the external affairs ministry and the intelligence department Research and Analysis Wing (RAW) have refused to give information relating to the declassification policy. MEA has declassified 121 files of 1950s and 1960s' vintage but these cannot be accessed as they have been stored in the foreign office's records management section rather than the National Archives of India. In response to an RTI query filed by Chandrachur Ghose, an activist campaigning for a comprehensive declassification policy in India, MEA has admitted that no records have been declassified in the last five years preceding 2009. While the ministry has steered clear of answering Ghose's query on the guidelines for declassification of documents, it has said that "for declassification of files or downgradation of he security grading on files, the files are referred to the head of concerned territorial division and on their recommendation, the files are declassified or downgraded''. In an attempt to get an overall picture of declassification in India, endthesecrecy.com filed RTI applications with PMO, the defence, home and external affairs ministries. The application to PMO and MHA also sought to know the declassification status at RAW and the Intelligence Bureau. But RAW has declined to give any information on the plea that the organisation is exempt from disclosure unless the details sought under RTI relate to charges of corruption or human rights violation. RAW has also cited national security in refusing information. "The information sought for is of classified nature and has security implications,'' according to RAW. Interestingly, most intelligence agencies world over are known to make at least some records public. "The world's top intelligence agencies do release old records, specially those dealing with their operations. In the last 10 years or so, CIA has released more than 30 million pages to public,'' Anuj Dhar, author of `CIA's Eye on South Asia' said. He added that UK's MI5 is also known to make periodic disclosure of its records even though it remains beyond the purview of the British Freedom of Information law. PMO had recently said that it was holding 28,685 classified files and not one of them had been declassified this year while the defence ministry has not declassified any records in the past few years. The manual that governs the declassification process in the government is itself classified. Will the Dalai Lama visit Tawang? This is the Dalai Lama's fifth visit to Tawang that he had passed through while fleeing to India in 1959. He has visited other parts of Arunachal six times since then. 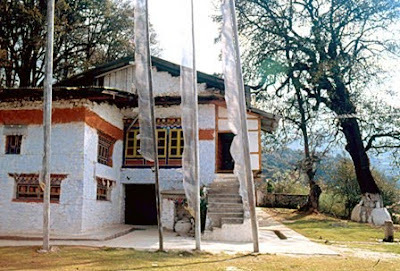 Beijing describes Tawang a part of China on grounds that the VIth Dalai Lama was born there in the 17th century. Will the People's Republic of China 'allow' the Government of India to clear the Dalai Lama's long-pending visit to Tawang. This is a serious question. The answer will show how far South Block is able to resist Beijing's bullying tactics. The Dalai Lama has repeatedly said that he stood by the Agreement signed in March 1914 between his predecessor's Administration and the Representative of British India, Sir Henry McMahon. The McMahon Line has been (since 1914) and is still today the border between India and Tibet (whatever is the status of Tibet). The fact that the Sixth Dalai is born in Tawang is irrelevant. Is France part of Kashmir because Dr. Karan Singh is born in Cannes on the French riviera? What about Liaquat Ali Khan born in Karnal, Haryana; Zia-ul-Haq born in Jallandar or Pervez Musharraf born in Darya Ganj, Delhi? Does this makes Haryana, Punjab or Delhi part of Pakistan? GUWAHATI/NEW DELHI: Amid reports of a Chinese military build-up in Tibet, the Dalai Lama has decided to visit Tawang in Arunachal Pradesh, which China claims as its own, in November. The proposed visit comes exactly a year after the exiled Tibetan leader dropped his plan to visit Tawang "because of the Lok Sabha elections''. "China doesn't need to worry about the trip. It's purely a spiritual and religious visit,'' said Chimme Choekyappa, the Dalai Lama's secretary. "All that I can tell you is that he is likely to go to Arunachal Pradesh in the second week of November. 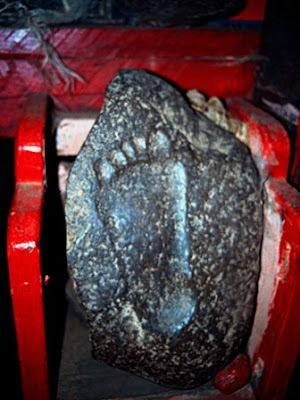 He is going there at the invitation from some local Buddhists,'' Choekyappa told TOI from Dharamsala. Though officials in Dharamsala aren't sure if the Tibetan leader would visit Tawang during his trip to Arunachal in November as the "tour itinerary is still being planned'', they hint that the spiritual leader may visit Tawang just like he did last month when he visited Taiwan for a "spiritual visit'' despite protests by Beijing. "India is a free country and there should be no problem in the Dalai Lama's visit to Tawang, considering the fact that he had come to India via Tawang and has visited the place before,'' said a Central Tibetan Administration official, on condition of anonymity. "We were very disappointed last year when the Indian government denied the Dalai Lama the permission to visit Tawang,'' the official added. Last year, the Dalai Lama was denied permission to visit Tawang, reportedly under pressure from China. Speaking about the proposed visit, T G Rimpoche, Congress MLA from Lumla and a close aide of the Dalai Lama, said the spiritual leader has agreed to visit Tawang. The trip is, however, subject to granting of the Restricted Area Permit by the Union home ministry a rule applicable to all foreign nationals visiting Arunachal. "It's now up to the Centre to grant him the permission,'' the MLA said. He added that November is the right time for the Dalai Lama to visit Arunachal because the weather would be good and the October 13 Assembly elections would be over by then. Besides holding spiritual and religious discourses, the Dalai Lama would inaugurate a multi-speciality hospital at Tawang with the money that he had got from his followers. If the Dalai Lama visits Tawang in November, it's likely to infuriate the Chinese who have been claiming that not just Tawang but the entire Arunachal is part of their territory. 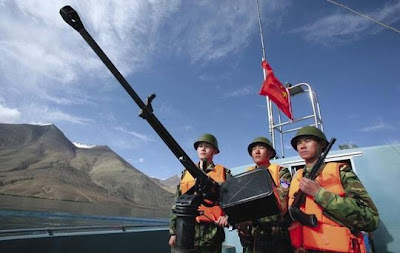 The Chinese have raised their pitch on the border issue in recent months and the visit if it happens will cloud Sino-Indian ties, which have been under strain of late due to reports of violations and skirmishes along the international border. "We are hopeful of the Indian government allowing the Dalai Lama's visit to Arunachal this time. It's a spiritual tour. Besides, it's important for India to take a firm stand on the issue of Tawang and send a signal to China,'' says the Tibetan official, on condition of anonymity. It may be recalled that soon after his visit to China last year, Prime Minister Manmohan Singh had gone to Arunachal to show that "the state was an integral part of India''. However, the PM didn't visit Tawang. China has opposed the planned visit of Tibetan spiritual leader Dalai Lama [ Images ] to Arunachal Pradesh and voiced 'strong concern' over the November trip. "China expresses strong concern about this information. The visit further reveals the Dalai clique's anti-China and separatist essence," the Washington Post reported on Friday quoting Reuters. "China's stance on the so-called Arunachal Pradesh is consistent. We firmly oppose Dalai visiting the so-called Arunachal Pradesh," Jiang Yu, the spokeswoman for China's Foreign Ministry, was quoted as saying in the report. The Dalai Lama, a Nobel Laureate, plans to visit Arunachal Pradesh in the middle of November though details are yet to be worked out. Last year, Arunachal Pradesh Chief Minister Dorjee Khandu visited Dharamsala in Himachal Pradesh [ Images ] to invite the Dalai Lama to visit Tawang to inaugurate a hospital. The Dalai Lama has contributed Rs 20 lakh for its construction. Tawang is home to one of the most sacred Buddhist monasteries. The Dalai Lama passed through this region when he fled into exile from Tibet [ Images ] in 1959. 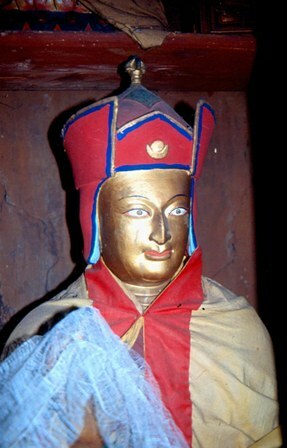 The sixth Dalai Lama was also born in Tawang in the 17th century. Good news! The Tibetan medical system, known as Sowa Rigpa or Art of Healing, has officially been recognized by the Government of India. Sowa Rigpa is also practiced in the entire Himalayan belt. Strangely, the word 'Tibet' or 'Tibetan' does not appear anywhere in the Government of India's release. It is probably not upset the Chinese, the 'owner' of 'Tibet'? Recently, I prepared a panel on Sowa Rigpa as part of an exhibition on Tibet. To download it, click here. Amendment of the Indian Medicine Central Council Act, 1970 The Union Cabinet today approved The Indian Medicine Central Council (Amendment) Bill, 2009 for amending the Indian Medicine Central Council Act, 1970. Sowa-Rigpa commonly known as Amchi is one of the oldest surviving system of medicine in the world, popular in the Himalayan region of India. In India this system is practiced in Sikkim, Arunachal Pradesh, Darjeeling (West Bengal), Lahoul and Spiti (Himachal Pradesh) and Ladakh region of Jammu & Kashmir. The theory and practices of Sowa-Rigpa are similar to Ayurveda, and also include few principles of Traditional Chinese Medicine. The fundamental text book rgyud-bzi of Sowa-Rigpa is believed to have been taught by Buddha himself and is closely linked with Buddhist philosophy. The Government of India has received representations from various quarters to grant recognition to the System of Sowa-Rigpa to enable it get a legal status. To confer legal status to Sowa-Rigpa amendments to section 2,3,8,9 and 17 of the Indian Medicine Central Council Act 1970, need to be carried out. The proposed amendments shall give effect to the inclusion of Sowa-Rigpa under sections 2,3,8,9 and 17 of the Indian Medicine Central Council Act, 1970 thereby recognizing this system legally. 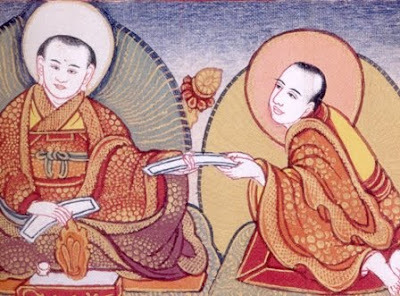 It is expected that the legal recognition of Sowa-Rigpa will lead to the protection and preservation of this ancient system of medicine and will help in its propagation and development. This will also open new vistas leading to collaborative research and scientific validation of the Sowa-Rigpa system, besides conservation and protection of the medicinal plants/minerals used in the system. The recognition of Sowa-Rigpa will also lead to the setting up of a mechanism to regulate the education and practice of Sowa-Rigpa . Mr. Zhang Qingli only knows to 'strike hard'. 'Quick approval, quick arrest, quick trial, quick execution' is his favorite motto. Mr. Zhang probably wants emulate his Beijing boss (and predecessor in Lhasa), Mr Hu who stroke so hard when he was Party Chief in Tibet (in 1988-1990), that Old Deng promoted him to the top. Unfortunately for Mr Zhang, the Times they are a changing, as Dylan prophesied, and what worked twenty years ago, may not work in the future. The Chinese authorities in “Tibet Autonomous Regions” (‘TAR’) has decided to launch a new “Strike Hard” campaign ahead of the 60th Anniversary of the National Day Celebration (starting 1 October) according to the official report posted on Xizang Re bao (Tibet Daily) dated 8 September 2009. Mr. Zhang lauded the Party members and security forces on the success in suppressing ‘riots’ and securing stability post March 14, 2008 and to take heed from last year’s success in putting more efforts in ‘checking and defeating the ‘Dalai clique’ and ‘separatists’ forces outside’. Though the main objective of the “Strike Hard’ campaign is cited as securing stability in the region ahead of the 60th National Day Celebration, the Tibetan Centre for Human Rights and Democracy (TCHRD) is deeply concern that under the guise of this campaign as they did in the past, State law enforcement agencies will abuse the fundamental human rights of the Tibetan people by enforcing to arbitrary arrest, detention, interrogation, the targeting and forced expulsion of former political prisoners from the capital prior to the anniversary. State agencies will also keep close surveillance on the monastic populations and impose restrictions on the movement of monks and nuns. TCHRD condemns the launch of "Strike Hard" campaign and questions the motive ahead of this major event. The last “Strike Hard” campaign that took place for 42-days, was launched on 18 January 2009, during which a total of 5,766 Tibetan suspects were rounded up and questioned. No official figure has ever been released regarding the number of suspects released or detained so far. "Strike Hard" (Ch: Yanda) campaign which was initiated in China in 1983 as an attempt to reduce crime and fight corruption within China, but which evolved into a political tool of oppression. In Tibet the campaign is implemented with the single aim to stifle political dissent. The New Indian Express has published my article on the 'confiscation 'of the Indian archives. This article has been published in the Edit Page of The Pioneer under the title Flawed Response to Incursions. Click here. Chinese incursions are making headlines in the Indian Press. It is good. Not because the Chinese persist in trespassing into Indian territory, but because the media bring some light onto such disturbing happenings. Instinctively, not to say genetically, the Indian leadership prefers to hide the truth, to not “hurt our Chinese neighbours’ feelings” or “makes things worse”. We could ask a question, why is the LAC not well defined? What is the point for successive NSAs to meet (13 times already since 2003), if they are not even able to define an ‘actual’ line? Apart from the fact that it proves the insincerity of the Chinese side which is not ready to make a first step to cool the tensions, the exercise seems a waste of public money. This time, the Army had the courage to acknowledge the facts. 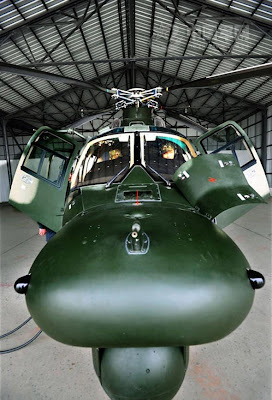 The Army Chief, General Deepak Kapoor admitted that India had lodged a protest with Beijing on the incursion of a Chinese helicopter into Indian territory and the painting of some rocks in red. The Press reported that “the army is gathering evidence from the spots where Chinese troops had painted rocks”. What does ‘gathering evidence’ mean? Does it imply that the Army is not aware of what is happening on the LAC in actual time? It is a serious and worrying lapse. This shyness of the Indian politicians and officials is not new. It is probably a genetic feature of the Foreign Service. In May, while spending some leisure time in Munsyari, the last town before the Indo-Tibet border in the Kumaon Hills, I located the ‘historian’ of area. Till the 1962 War, this tehsil used to be the main center for business with Western Tibet. Most of the Bothias, the local tribes lived on trade. 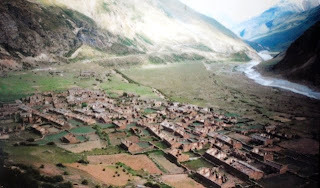 Caravans used to depart from Milam, a village in Johar Valley, north of Munsyari and proceed to the trade markets around the Kailash-Mansarovar area. The old ‘historian’ told me a story which flabbergasted me. A gentleman native to the area, called Lakshan Singh Jangpangi, had joined the Foreign Service in the forties as a senior accountant in Indian Trade Mart of Gartok, east of the Kailash. In 1946, he was promoted to the important post of British Trade Agent. When India became independent, he continued to serve in the same position till he was transferred to Yatung in 1959. I was told that Mr Jangpangi, who from Gartok had a panoramic view on what was going on in Western Tibet, had informed his Minister (Jawaharlal Nehru) that the Chinese had started to build on the arid Aksai Chin plateau. It was 1951-52. Crossing the Indian territory, the road only became the object of official correspondence with the Chinese Government seven years later. It was finally debated in the Parliament in 1959. Probably, the government did not want ‘to hurt Chinese sentiments’ or believe that time would solve the issue. The most ironic part of the story is that Jangpangi was awarded the first Padma Shri Award given to a Kumaoni ‘for his meritorious services’. Was it for breaking the news or for having kept quiet? We will probably never know. Today, if a courageous historian requests one day the government to declassify this file, he will be quoted Article 8 (1) (a) of the Right to Information Act: “there shall be no obligation to give any citizen, information, disclosure of which would prejudicially affect the sovereignty and integrity of India, the security, strategic, scientific or economic interests of the State”. The Chinese incursions continued in the fifties in Garwal (Barahoti), Himachal Pradesh (Shipkila) and then spread to Ladakh and NEFA. Mao’s regime could have only been encouraged by the Government of India’s feeble complaints. Delhi was probably satisfied with its seasonal protests and the immediate denials from Beijing. Hundreds of such complaints have been recorded in the 14 Volumes of the White Papers published from 1959 to 1965 by the Ministry of External Affairs. A telling incident is worth recalling. In September 1956, 20 Chinese crossed over the Shipki-la pass into Himachal Pradesh. A 27-member Border Security Force party met the Chinese the same day. The BSF were told by a Chinese officer that he was instructed to patrol right up to Hupsang Khad (4 miles south of Shipki La, the acknowledged border pass under the Panchsheel Agreement). The BSF were however advised "to avoid an armed clash but not yield to the Chinese troops." Delhi did not know how to react. A few days later, Nehru wrote to the Foreign Secretary: "I agree with [your] suggestion …it would not be desirable for this question to be raised in the Lok Sabha at the present stage." The policy of the Indian government was to keep the matter quiet and eventually mention it 'informally' to the Chinese officials. Finally, the MEA informed Beijing "The Government of India are pained and surprised at this conduct of the Chinese commanding officer." This was fifty-three years ago. Is the situation different today? One more irony: the Chief Minister of Jammu and Kashmir, Omar Abdullah stated that India has the right to respond: "It is our right to respond in case of ceasefire violations." Of course, he was speaking about Pakistan and the other corner of his State. He would not have dared to use these words with China. It is depressing. I have an Indian friend, knowledgeable in defense matters, who always tells me that one should not worry, that genes can evolve, even Darwin says so. Is it just a matter or one or two generations for Indians to get Chinese genes? Let us see. Is China Really Serious About Improving Ties With India? The Statesman published my article on the Consulate in Lhasa. Click here to read.